Barcelona is the city where the great architect Antoni Gaudí produced his most important and famous works which today define the look of the Catalan metropolis. We will visit four of them, all of which are UNESCO World Heritage Sites. 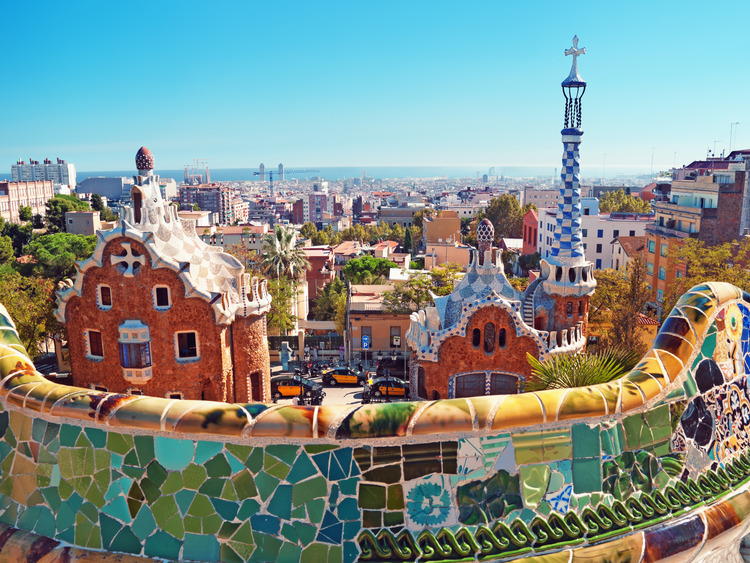 The first destination on our excursion will be the highly original Parc Güell, designed by Gaudí at the turn of the last century and created in collaboration with his disciples. Entering the park, we will be plunged into a surreal, picturesque setting: fairy-tale buildings, a gigantic salamander decorated with mosaics, forests of columns and a house with spires where the artist lived for twenty years. We will return to the coach and a short journey will take us to Eixample, the district that is home to the famous Sagrada Familia church (tour of the exterior). This gigantic work is still under construction decades later, following the plans left by the master architect. Our local guide will point out the most distinctive details of the façade, a demonstration of Gaudí's incredible creativity in its own right. Before continuing our tour, we will have some free time to stroll around the district and do a bit of shopping. Then we will continue on towards Casa Milà, better known as La Pedrera (literally "The Quarry"), one of Gaudí's last works and the greatest example of Catalan modernism. The building, the last civil work designed by the master architect, is a true triumph of curved lines with undulating faces, chimneys that coil around one another and the magnificent wrought iron railings resembling breaking waves. The next masterpiece that we will visit on our tour is Casa Batllò, a residential building enveloped in a surreal atmosphere. We will admire the façade and roof, covered entirely in glistening multi-coloured scales. The extravagant inventiveness of the shapes is inspired by the legend of Saint George (the patron saint of Catalonia) who fought the dragon, alluded to in the sinuosity of the roof, while the rows of balconies and bone-like structures symbolise the victims. On our way back to the ship, we will pass through the commercial heart of the historic centre, the famous Plaça de Catalunya and the port area before bringing this magical day to a close.